Favours, also known as bonbonniere, are another ‘wedding tradition’ foisted upon couples by the bridal industry. Unfortunately, if you’ve ever had the pleasure of trawling through the interwebs looking for favours, you’ll know that there some pretty ugly and expensive ones out there. I found some heart-shaped salt and pepper shakers that look very much like the derrières of classical Greek statues. While said salt and pepper shakers range around $5-6 per set, there are cheaper gift alternatives. Australian Favours sports a thong-shaped luggage tag for $2.50 each. Heh, I’d rather spend my money on something that better reflects us as a couple. Since we’ve collected nearly everyone’s email addresses, I was planning on gifting iTunes songs. They’re cheap, environmentally friendly, and song choice allows for a more personal gift. However, accepting an iTunes song gift will probably be beyond the technical ability of guests who are still struggling to get onto the wedding blog. As a joke, I suggested that we give away jars of honey, since Cheap Geek’s surname is ‘Honey’. My friend and wedding helper Sarah seized upon the suggestion, telling me that it would be a waste of an opportunity if I didn’t provide honey favours for all my guests. A Google search brought up two businesses that sold honey favours. Kelly Beans charge $3.60 per jar for 100-199 jars, whilst Maya Sunny do organic honey jars for $4.95 each. It’s not much, but I wasn’t sure if I wanted to allocate $350-$500 of the wedding budget on honey, considering my dress cost less than $100. 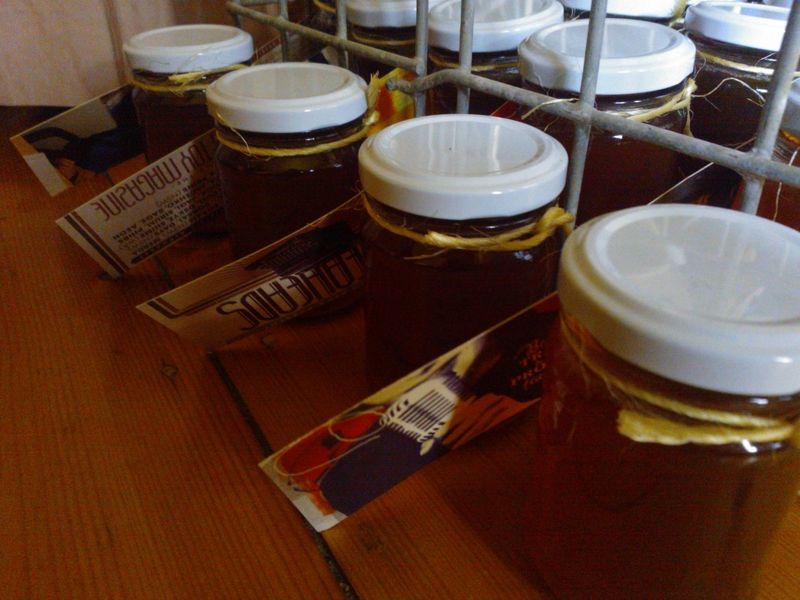 Cheap Geek and I decided to source our own honey and jars. We bought our honey from Walkabout Apiaries, a producer in Victoria’s northeast. The region is special to both of us: Cheap Geek used to spend his summers in Bright, and I spent most of 2005 working in Wangaratta. Greg, the guy from Walkabout, was really helpful. He told us how much honey we needed, how to prevent crystals from forming, and gave us a good deal on our bulk buy. The 15 kilos of honey we ordered ended up costing us $97. Kitchen garden specialists Bulleen Art and Garden stocked 150mL produce jars. At $0.75, they were competitively priced compared to online stockists. Since I was collecting the jars in person, I saved on postage and handling. I also got further discounts by buying on bulk and or waiting for sales. In the end, a 100 jars cost me only $65. The jars were hand-washed in warm soapy water, rinsed, and air dried in an oven set at 100 degrees C. They were then filled with help from a ladle and a funnel. Avant postcards that I had collected over the years were cut up into strips and turned into tags. We also used some string we already had, stamps we were already using on other wedding stationery, a hole punch, and $7 worth of Avery labels from Officeworks. In the end, a hundred honey jars ended up costing us $170 in total or $1.70 per jar, about the same price as an iTunes song. Previous postIs your employer actually making super contributions?